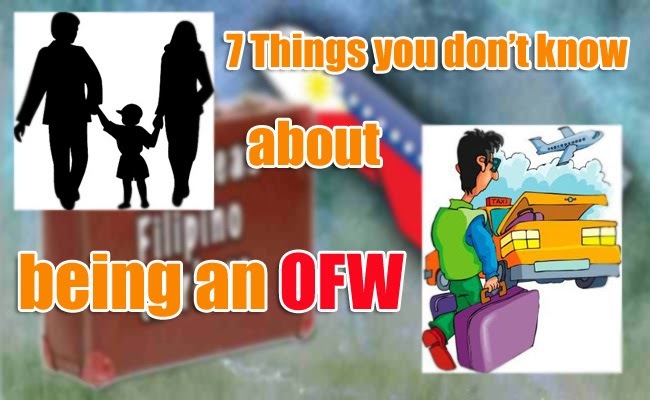 A lot of Filipinos are aspiring to be an OFW. Many OFWs are even making their children and grandchildren take an in-demand course abroad such as nursing, so they can also be an OFW someday. Many homes were built and many children were raised with OFW remittance and even the economy was boosted. Some did not care what job lies ahead, what is important is to earn more than they could ever earn in their homeland. We see their photos with all smile, going to beautiful places, having parties with kababayans and other friends, but we don’t see these facts in the life of an OFW. Facebook and other social media shows gifts, expensive perfumes, shoes and clothes to be sent home to their loved ones back home. There are photos of travels around the country and dining experiences. They are all full of smiles and fun, yet this is only a small part of their lives as an OFW. They will not post photos of their hard work, their struggle with the immigration, the bad boss, the cramped living quarters, exhaustion, emotional stress and lay offs. They don’t share being in a job that is far from their profession back home, like a nurse who became a nanny or a domestic helper. Even if OFWs are confident with their English, they are bound to feel out of place. Their English will be no match to the native speakers who speaks fast and with slangs. Moving to a different place, especially in a place with a different language is stressful. They miss their homes or the feeling of being closely attached with someone. Unfortunately, other Filipinos are also busy with their own jobs. Being with other Filipinos could be a breath of fresh air but it is only for a limited time. There are times when they want a family to be near, that someone will recognize them in the streets and greet them, that someone will visit them and check how they are doing. However, nobody does that and they end up feeling invisible. It is always a given that whenever the family needs money, the person abroad will be the first one to be asked for help. It seems that those who are left in the homeland had the notion that the OFW family member will easily make a way tp provide the financial need. Many also seemed to think that OFWs actually won a lotto just because they work abroad and the currency has a higher rate. Many asks money for baptism, birthday party, business capital, and others because an OFW seems to always have a cash to spare. Many OFWs think twice before answering a phone call as it usually means that someone needs money. They feel that sometimes people get in touch with them just because they have financial needs. Others are even forced to work more years abroad to provide for the family even though all they want is to go home and be with them. Many forget that those who live abroad also have financial responsibilities. While they earn more than the earnings back in the homeland, the cost of living abroad is also higher, yet they will never admit it to their family. They will do anything to provide what their family needs and wants. It does not matter if they have to work double or triple jobs, borrow money from a fellow OFW, or max out their credit cards and be buried in debt, just to give the gifts their children want. They will bare in mind that their family must enjoy the sacrifices of being away from them. It does not matter if their family thinks of them as an all year Santa Clause, what matters is that they can provide everything other than being home and starve together. There will be some OFWs who may not have health and accident insurance or even a government protection. If they get sick or if they get into an accident, nobody will be there to take care of them unless they have a family member of a significant other nearby. Many just shrug off their cold and flu just not to miss earning for that certain day. There will always be a fear of getting into an accident or having a serious illness as many back home are depending in their income. All they can rely on are prayers and their faith that God will keep them safe. The stress of being very far away from the family, the enormous sacrifices and the tiredness of working most of the hours and sleeping less will be taking its toll on the OFWs and there will be times that they wish to drop everything off and just go home. However, they will also then start to think of the debt they made just to go abroad. They think of the family that depends on them and how else they could provide. Many OFWs are in cycles of debt that may be hard to get out off. Others are forced to go back abroad because because they see the need of their family. They can’t easily save up money and they will have to go back because there are still much to be provided. Also, it will be hard to disappoint their family. Many wish to go home and have a simple life, where there are not much of financial responsibilities. OFWs work hard and sometimes a few hours of sleep is the only rest they could have, yet they sacrifice even their lost time with their families just for them to have a better life. There is also a risk that they may end up going home without any savings. Then they will be forced to go back and work harder. They will always long of a retirement in the country and finally unite with their loved ones. There will be some children who only knew their parents through Skype and Facebook. Couples will always be looking forward to that short moment to be in each other’s arms. Being an OFW is not winning a lotto and living the dreams. To most, it is the only means for their family to survive. They bare the weight of financial means to give their families a better life and maybe someday their children do not have to be away from their homes anymore but the OFW life is a cycle. They do not whine of their sacrifices but these secret parts of their lives is just a reminder that their lives is not bread and honey at all. Maybe it is the lives of those who are left behind who had the better part of the deal. Philippines had been sending labors to countries all over the globe. Best doctors, nurses, architects, professors and others choose to work abroad as factory workers, nannies, assistants and many more because staying in the home country is not enough. Maybe it is time to fix the country’s system so family’s won’t have to be torn apart by poverty.